He wasn’t talking Jean-Paul Sartre. Before Trump-Think becomes official, the outgoing president made one last pitch for sanity and calm. Going after the fascists during World War II was one thing. But we aren’t facing anything near that sort of threat. To do otherwise would also mean that, as a country, we have failed to learn one of the lessons that Dec. 7, 1941 should have taught us. Certainly, we honor the veterans, the survivors of the surprise bombings on the morning of Dec. 7. But on the “date which will live in infamy,” Asian Americans in particular recall more than just the horrific event that led to the U.S. entering World War II. It was also the day that led to the surprise attack on innocent Americans of Japanese descent, who would soon find that their nation would throw out the Constitution and let them know it no longer applied to them. It took one day for the U.S. to declare war on Japan on Dec. 8, and then, just over two months for President Roosevelt to declare Executive Order 9066, on February 19, 1942. The day that tore Asian America apart. Mike Honda was little more than six-months-old on Pearl Harbor Day. By the time he was just a year old, Honda was with his family, in a camp, a child of the internment. Now, Honda is hoping that we don’t forget history as a Trump administration could put into place promises of a ban on Muslims, extreme vetting, or even a Muslim registry. Since 2001, Honda has been that leading national voice in Congress, representing California’s 17th District, and as the chair emeritus of the Congressional Asian Pacific American Caucus. He has been a vital moral presence for Asian Americans nationally–but soon, no longer as a member of Congress. On Nov. 8, Honda lost to Ro Khanna, another Democrat and an Indian American, by a huge 61 percent to 39 percent margin. “I wasn’t happy; I thought it would be a little closer than that,” Honda said, still looking for answers. He’s not sure if it was the change atmosphere that overcame the national electorate that defeated Hillary Clinton and elected Trump. Or if it was the well-financed and well-run political campaign of Khanna, a serial office seeker who targeted Honda’s seat four years ago and garnered high-tech money and the support of local press to pound Honda down. Another issue was his ethics case involving the use of campaign funds. Honda has always told me it was a non-issue, that it was a matter of Congress’ own rules and not federal law. In other words, it looked worse than it appeared. But that’s all Khanna needed to diffuse the power of incumbency and drive a wedge into Honda’s base of longtime labor support. The district has lost a congressman with seniority, who brought tens of millions of dollars in federal funds to his district, and will now be represented by a freshman. And Asian America has lost a fighter in Congress whose voice will be missed. 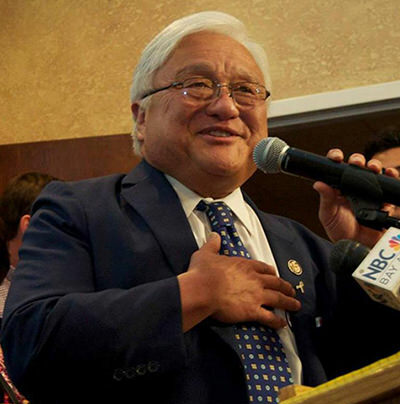 I had thought that at age 75, Mike Honda deserved to call his departure from Congress. But that’s not to be. And another run for office, he told me, is unlikely. Honda said he’s seeking another way to influence public opinion now, in the same way the heroic civil rights leaders in the past brought about change, through activism and civil disobedience. So Honda leaves Congress an activist at heart, ready to make his mark in a new way. He remains an advocate for Asian Americans, but especially on human rights issues such as the comfort women of World War II, organizing victim countries to fight human trafficking, and challenging the Japanese government to apologize. Domestically, Honda remains a staunch LGBTQIA hero, having come out in support of his 8-year-old transgender granddaughter, Malisa. And he will continue to speak out against efforts to ban or register Muslims and against immigration restrictions, including any reversal of DACA. Despite his congressional loss, Honda remains a voice and a symbol for the nation, the example of the high road. A child of the internment, he’s a reminder to America of the mistakes it has made.